I have had a long day. After giving my scooter for servicing I had my haircut. At the saloon, I heard the news of veteran Kannada actor Vishnuvardhan’s death. The barber became sentimental as the FM played “Nooru Ondu Nenapu” and he told how touched he was by this bad news; the other barber said he had wept uncontrollably at Dr Rajkumar’s death and I sat there touched by how the celebrities touch us common men and also wondering if the barber would quickly finish off my haircut; made two waste trips to Jayanagar only to find shops closed, buildings with broken glass panes which made me realize how stupid sometimes people become in trying to display their ego by hiding their act behind fake reasons such as “mark of respect”. If true respect has to be shown to a person you admire, mourn peacefully. Its almost 11 and I have seen many movies today of which one I would like to mention is “Rachel getting Married”; Story about a girl returning from a re-habilitation center to her broken family, during the occasion of her sister’s wedding to realize how each one has suffered from one tragic moment of their life – their little brother’s death. Very nicely told but could not help noticing close resemblance to Mira Nair’s “Monsoon Wedding” theme and treatment. Few other movies that I watched recently – “The wrestler” which made me sad at the facts but at the same time the movie was pathetically slow. “Miss Pettigrew lives for a day” is a beautifully made film but with a predictable story line. “Burn after Reading” is a black comedy and is a must watch with unexpected storyline with several twists. “An Unfinished Life” is a simple story about relationships and worth watching for Robert Redford and Morgan freeman. And as I realize this would be my last post for the year, it’s wonderful to remember 2009 as a great year for some very special memories, great beginnings, new hobbies and lots of travels. I intended to write something other than traveling this time, something about the happenings; something more personal; about something that I thought or felt but travel does not seem to leave me. 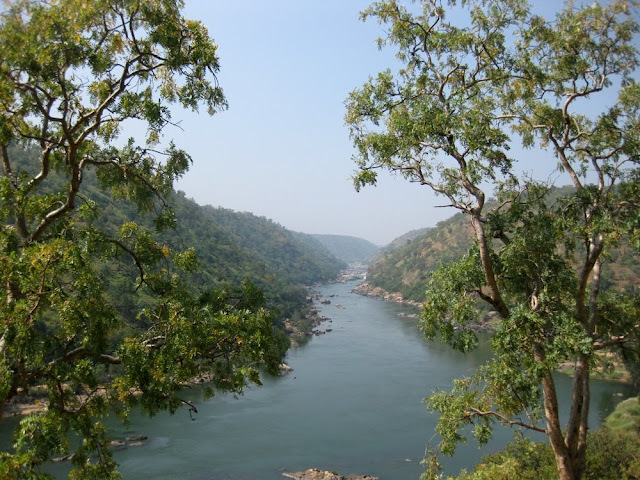 We had a team outing from office to Doddamakali jungle lodges (One of the three in the same belt along river Cauvery- others being Beemeshvari and Galibore). It’s always fun to be out along with our team because I feel that we are a group with lot of likeminded people and that’s what makes it special. In two tempo travelers we started off to Kanakpura, watching movies and chatting we reached the busy town at around 10:15 AM. We had breakfast at hotel Vasu which was extremely crowded. A villager standing next to me had warnings about the place we were about to visit. 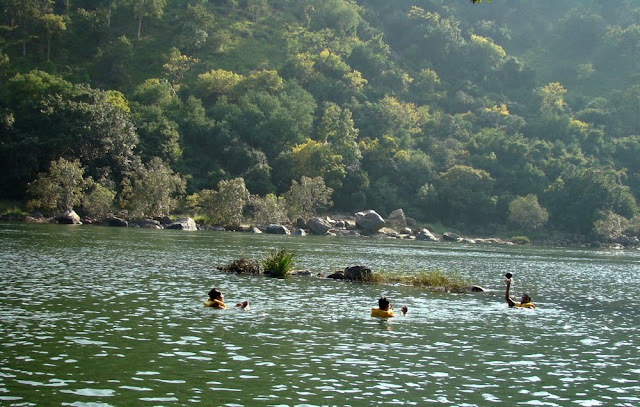 He suggested we not swim as many have drowned in the Cauvery and he kept repeating several stories. Kanakpura to Shimshapura and then 3 km of mud road to the resort, we were there at around 11. After a quick welcome drink and settling some confusion with the authorities who were not informed of our booking, we set off on a trekking around the resort. The place is nice, with some greenery and elegantly flowing river. Rest of the day after a nice lunch, was spent swimming. I was happy to reuse my learning’s from the Honnemardu trip. Thanks to Nomitha for teaching us to swim with life jackets on. :-) Rented out a bicycle to ride around; played volleyball and cards. It’s been a lot of traveling over the past few weeks and when more travels line up…there are more reasons to be happy. :-) A common friend’s wedding reception is what took my friends and me to Hubli. An overnight train journey with lots of talking; early morning hunt for an economical hotel; breakfast number one – tea, kesari bath and amazingly tasty, hot poha; a walk around the hotel; Breakfast number two at cities famous Hotel, Krishna Bhavan – Idly-vada, Poori and tea; bus journey to a wrong address and hunting for the wedding hall which apparently was a mere 3km walk from where we were; a moosumbi juice and then a long walk to the hall; breakfast number three – Poha again and delicious bason ladoo at the reception; meeting all the wonderful relatives of my friend; nice lunch and then…and then? 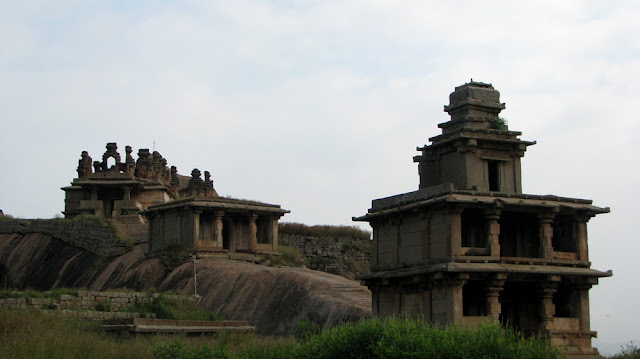 Well Subbu and I are always okay for more travel so we had planned a detour during our backward journey – Chitradurga. Thanks to our friends Mak and Swamy for their valuable inputs on the city. Our plan was to explore the fort and any other interesting place. So we boarded a bus from Hubli at around 3:00 PM and reach Durga at 9:30 PM. We quickly booked a decent hotel and had dinner at a Kanavali. Kanavali’s are small mess that you will find plenty in these parts of the state which serve great home cooked food such as chapathi, rice, sabji and sambhar. After that we took a short walk to the fort and got informed by the guards that the fort would open at 6:00 AM. We bid goodbye to another friend who had to leave to Bangalore; back to hotel; crash to bed. Next morning, at around 6:30 AM I took a short walk around the hotel as always to watch the town wakeup. Everything seemed very slow and quite. At 7:30 AM, we were ready to leave to the fort after a very nice breakfast at a nice hotel by name Mysore cafe. We booked a Government authorized guide for the tour within the fort for Rs 250. The fort was built to have 7 spirals with 7 entrances out of which the first two, now lie as ruins encroached by the city. 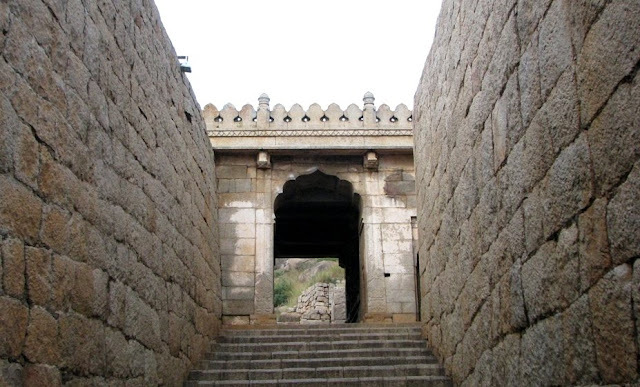 Huge door hinges, a huge gun powder grinding setup, temples, mutt’s and of course the famous Onake Obava kindi where she killed the Hyder Ali soldiers entering from the cave with her Onake (Masse) not to disturb her husband during his lunch time. 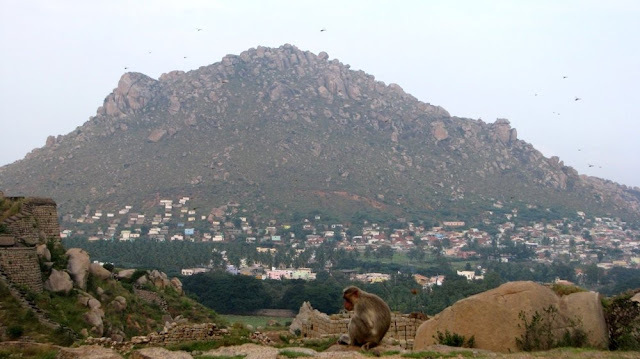 We climbed a huge rock (Thupada Kolla – Pond of ghee) and relaxed at the summit for a while overlooking the town and surrounding landscape. Back at the fort entrance we met Jyothiraj alias Kothiraj who is known for his free climbing. On Sundays he usually comes to the fort and performs for the visitors. 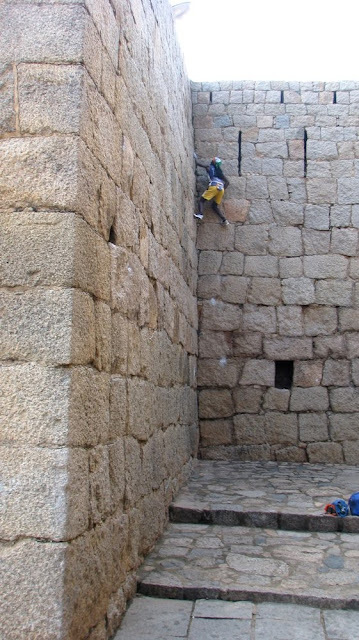 He climbed the walls very quickly and smartly with absolutely no modern equipments but arm strength. Everyone applauded to his skill and he shared his story of struggle and how he still lacks proper aid to buy the necessary equipments for rock climbing. He has traveled around the world but still feels that our country never shows interest in promoting several sports or skills. We next walked to the Laxmi tiffin room, a very famous and old restaurant in the town where we tasted some amazing masala dosa, kali dosa and extremely refreshing and uniquely tasty tea. We thought of renting out a bicycle but we did not find good cycles and even if would have, renting out to tourists would have been a difficult task. So we took an auto to Chandravalli, which is about 3Kms from the main busstand. A small shrine and a cave is a major highlight. We decided to enter the dark cave with the torch light from the cell phone with reducing battery life. A few minutes and we felt too deep into the cave, but we finished the entire stretch as the cave turns back to the same entrance. During a walk around the place we met a group of villagers who were partying at the place with hot drinks and open air kitchen set up that was cooking some flesh. They invited us to taste some food and believe me even though I liked their friendliness I have never been so happy to be a vegetarian. The sight of badly cooked chicken and beef made my stomach churn. They requested for a group photo and wanted it mailed to them. After politely declining their request to have mutton Biryani we walked into the forest where we met an old man, a forest guard who was very delighted to see us and gave us the entire mythological importance of the place. I have heard stories of Bhima, Bakasura and Krishna so many times in my life but believe me never ever was it told, this passionately and interestingly as the old man did. His way of narration was amazing and very expressive with frequent pauses for a laugh or a sigh. “Bandbitlu Kunti vapas Siddapura’ge, illey pakad uru” (So kunti returned back to Siddapura, here, the next village) “Enu odda nodi bheema, bakasura na.” (You must have seen the way Bheema kicked Bakasura) so he went on and on, one story over another and surprisingly both Subbu and I did not try to stop him, we listened to it with lot of interest but then it had to stop at some point, we had to leave. So we thanked the old man and returned back to hotel and packed our bags. After lunch at the kanavali we headed back to Bangalore at around 3:00 and reached the city at 8:30 PM. The trip was amazing, I think because it incorporated all aspects of a travel; a beautiful place with historical importance; a hike; a taste of local cuisine at towns old and famous restaurants; a good interaction with the locals; unplanned, last minute decisions and most important of all a like-minded company. If I said – “let’s climb the rock” Subbu would start looking for the route and if he said- “Let’s have food” (which he very frequently does. :-)), I asked him to order two plates, whatever it was. :-) All in all a great trip with some true explorations. Only thing best to falling asleep in a mountain is to wake up in one. The morning was very pleasant and the wind had subsided. We freshen up quickly, collected enough water that was required for the rest of the journey and wasting no more time, we started off to the peak (At 7:00AM). Our plan for the day was to climb the peak and then descend towards Coorg to a check post at Bidadhalli not later than 3:45PM, because that’s when the only bus leaves from the village to Somwarpet. The hike up to the peak was fun with several false peaks becoming a point of confusion. First was Bathadarashi, next Kall Gudde, next Shesha parvatha and next Pushpagiri. Wait a minute…we were expecting Kumara Paravatha, right? 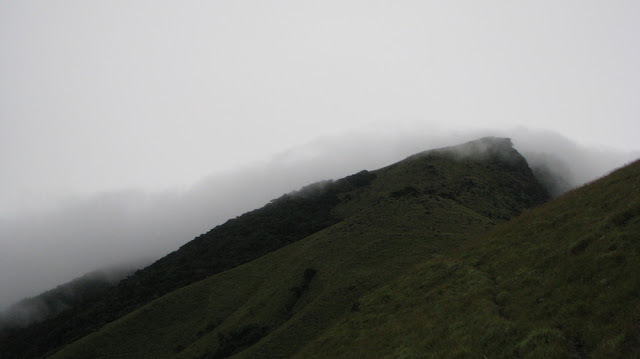 So why does the peak have a board saying Pushpagiri peak – 0Kms. Anyways…after some exploration at the top, we noticed the Shiva Linga and other small shrines that confirmed that we were at KP. 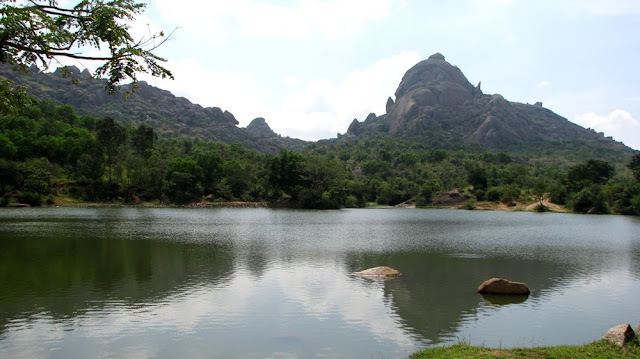 But anyway… the Pushpagiri – KP confusion still exist, well we are happy to convince ourselves that both are names for same peak from either districts. The last stretch to the peak was a little dangerous with slippery rocks. We relaxed at the peak for a while; a guy from another group had lost his friends and also the way to return. With little food and water we showed him the way back to Bhatra house. A little disappointment was the mist, due to which we did not get a clear view from the peak. 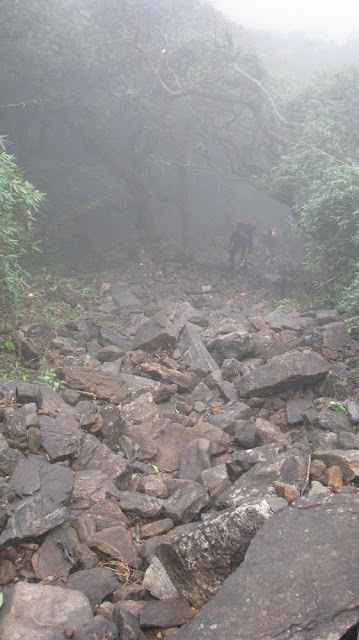 At around 10:40 AM we headed back towards Bidadhalli which was 7Kms from the peak. Climbing down huge slippery rocks that separated the trail was a challenge. Getting down was very easy and fast. In between we met the lost friends of the guy we had met at the peak who by mistake had climbed down the wrong route and were lost too. We told them that they could find their friend in Bhatra house. We reached Bidadhalli check post at around 2:00 PM. But the next walk of around 5kms to the main road on a paved route was boring and tiring as we had already convinced ourselves that the trek was over. We reached the bus stop at around 3:15 PM and had packed chapatis for lunch. The bus arrived on time and we drove to Somwarpet. A lady (villager) sitting next to me was very curious to know about our adventures and expressed her interest to do the same but she said she was scared. From Somwarpet we boarded a bus to Kushalnagar where we had dinner at Shanti hotel run by Muslims. Delicious Biryani and special tea filled our stomachs. Next was another bus journey to Mysore and then another to Bangalore. The trek was amazing and adventurous with many interesting incidents and events. Most of all the group was amazing with everyone in sync with one another. KP is one of the best treks I have been to so far.